Prototype: Swiss Federal Railways (SBB/CFF/FFS) class Ae 3/6 II express locomotive. Fir green paint scheme. Road number 10443. The locomotive looks as it did around 1935. Model: The locomotive has an mfx+ digital decoder and extensive sound functions. It also has controlled high-efficiency propulsion. 3 axles and 2 jackshafts powered. Traction tires. The triple headlights and one white marker light (Swiss headlight code) change over with the direction of travel, will work in conventional operation, and can be controlled digitally. The lighting can be switched to a red marker light. Maintenance-free warm white and red LEDs are used for the lighting. The locomotive has separately applied metal grab irons. Length over the buffers 16 cm / 6-5/16". LED lighting for the first time. 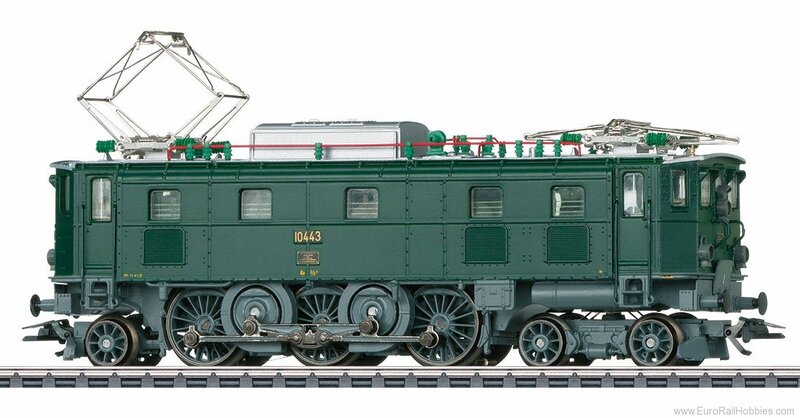 A passenger car set to go with this locomotive can be found in the Marklin H0 assortment under item number 42386.